December is an endless buffet of glazed ham, prime rib, mashed potatoes, cheese platters, biscuits, and dinner rolls. Let’s not even get started on all the cookies, brownies, cheesecakes, and other sweet treats the holidays brings. I’ve never been one to shy away from the dessert table. That’s usually my first stop at any holiday party. To prevent my sweet tooth from going overboard, portion control has become my best friend. I believe that just a taste should do the trick. Mini desserts the cutest and best way to successfully achieve portion control. How could you refuse a mini cupcake? It’s like not smiling after seeing a puppy. 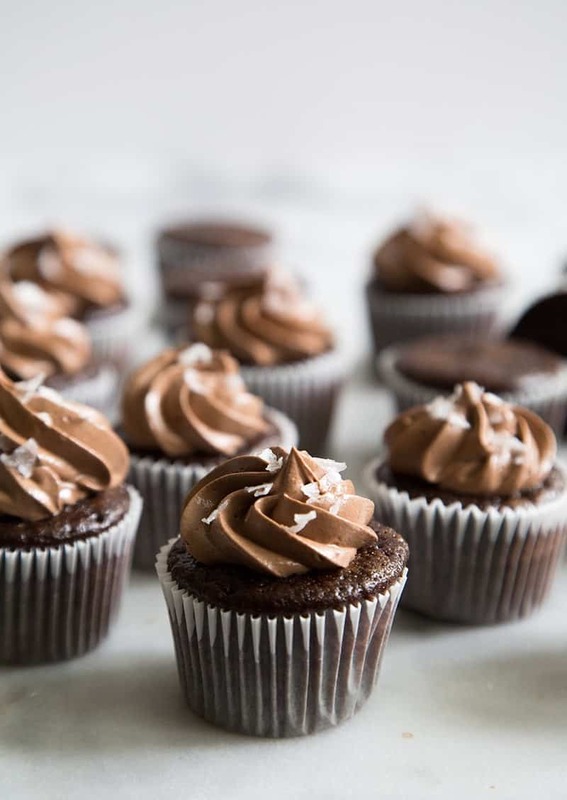 Could you really say no to these mini chocolate cupcakes with sea salt flake topped chocolate buttercream? I thought so. I’ve teamed up with Born Sweet® Zing™ Baking Blend to create a dessert that is not only cute and mini, but has fewer calories than its traditional counterpart. It’s that whole notion of having your cake and eating it, too, but on another level. 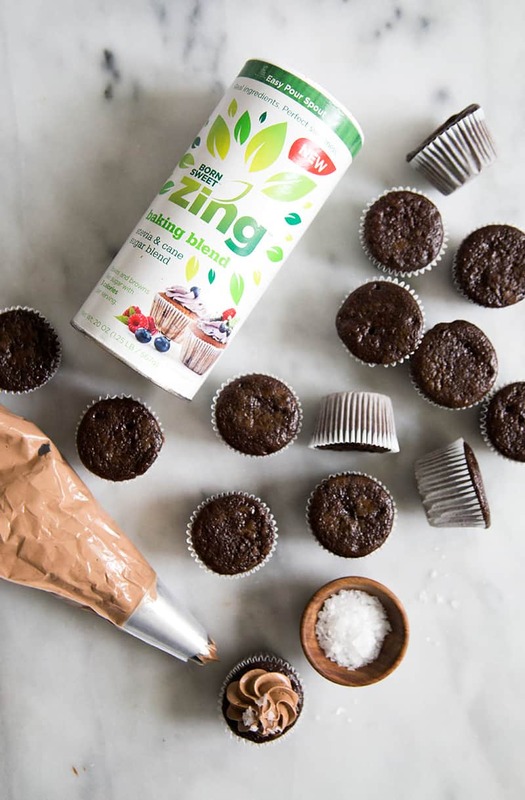 Zing™ Baking Blend is a combination of Stevia leaf extract and pure cane sugar. It bakes and browns just like granulated sugar. It’s easy to swap Zing™ Baking Blend into your favorite recipes. You’ll just need to slightly adjust the amount of sweetener the recipe calls for. For every one cup of granulated sugar, you’ll only need 1/2 cup of Zing™. I used Zing™ in two applications for this dessert to test it’s versatility. I used it to lightly sweeten the chocolate cupcake batter, and also to create the meringue base for this Swiss style buttercream. It worked like a charm in both recipes. Side note: Don’t worry. This cupcake batter is a little runny. It will bake up moist and flavorful in the oven. 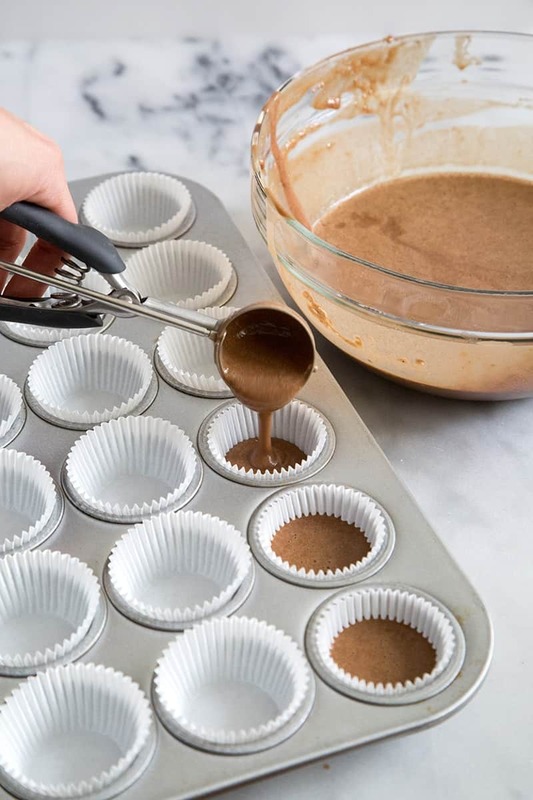 Use a mini cookie scoop or ladle to help portion out the batter. During the holidays, my mini cupcake tin gets worked overtime. 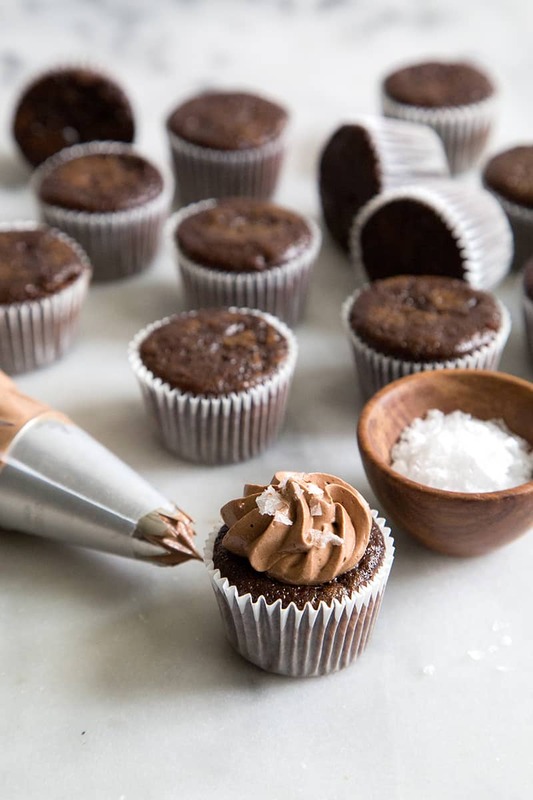 You can use this mini cupcake tin for other recipes like these milk chocolate pecan cups. 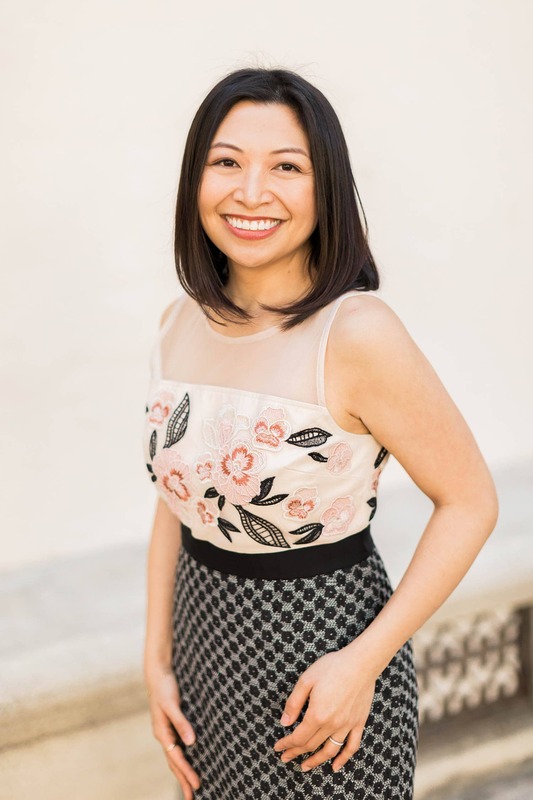 As my family’s resident dessert maker, I’m always on the search for new baking products, techniques, and recipes to share with loved one during the holidays. 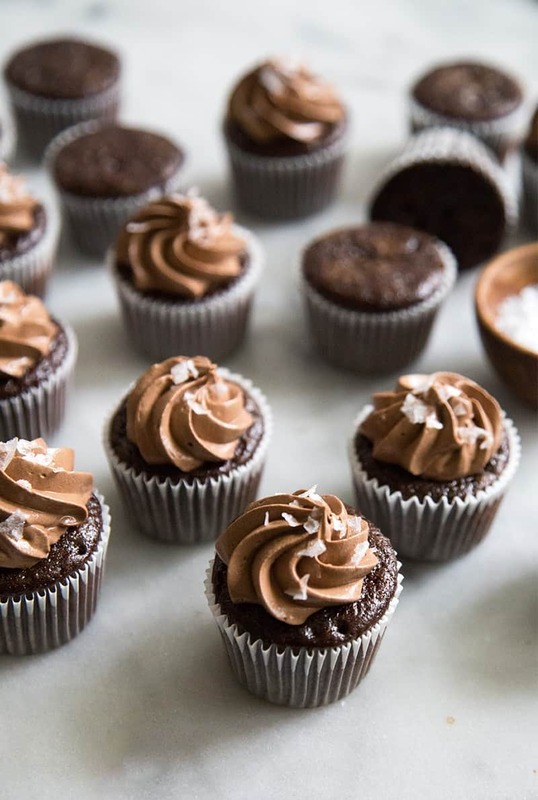 These mini chocolate cupcakes are a quick dessert to make in a hurry. You don’t need a mixer to make the batter and it only takes 15 mintes to bake. The Swiss buttercream may take a little effort, but it’s well worth it. Instead of the traditional dense and heavy buttercream made with powdered sugar and butter, Swiss style buttercream is light, smooth, and airy thanks to the meringue base (made with egg whites and sugar). This holiday season, instead of worrying so much about the calories, focus on spending time with family and friends. It’s really easy to go overboard when there is so much food available. Cut out the worry and guilt of eating too much sugar by making healthy choices and surrounding yourself with manageable sized servings. Be sure to visit the Zing™ Baking Blend website to find your local retailer, as well as more holiday inspired desserts! 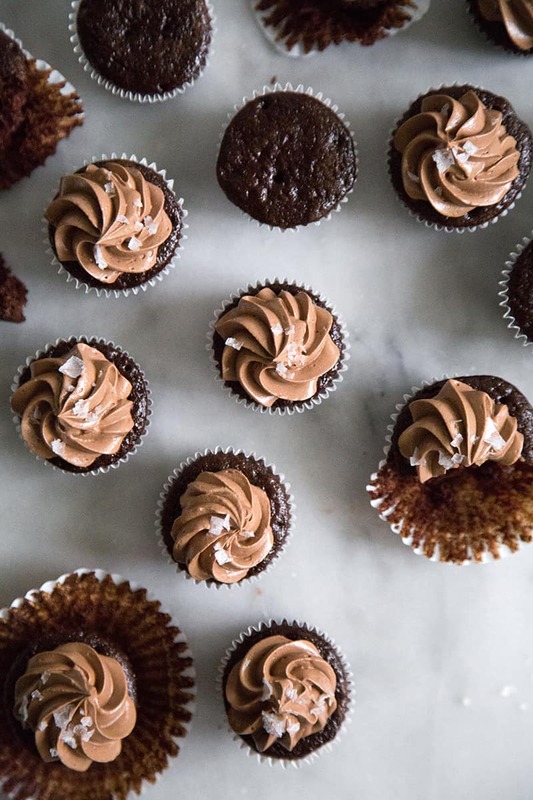 These mini chocolate cupcakes with chocolate buttercream are topped with a light sprinkle of sea salt flakes to balance out the flavors. It's a cute little addition to any dessert table. Preheat oven to 325 degrees F. Line mini cupcake tin with paper liners. Set aside. In a large bowl, whisk together egg, Zing™ Baking Blend, olive oil, and vanilla. Whisk until smooth. In another bowl, combine hot water, cocoa powder, and espresso powder. Mix until smooth. Add milk and mix until incorporated. Add to egg mixture and whisk to combine. Add dry flour mixture and whisk until batter is smooth. Batter will bubble slightly due to the baking soda. Let batter sit for 5 minutes to slightly thicken. Divide batter among prepared cupcake liners. Bake for 15 minutes until cupcake tops spring back to touch. Allow to cool in tin for 3 minutes before transferring to wire rack to cool to room temperature. In the bowl of a stand mixer, whisk together egg whites and Zing™ Baking Blend. Place over a double boiler and continue to whisk until mixture is smooth and all the Zing is dissolved. You can test this by dipped your finger into the warm mixture and rubbing it together with your thumb. You should not be able to feel the granules of Zing. Return bowl to stand mixer. Using a whisk or paddle attachment, beat mixture at low speed until mixture is foamy. Increase to medium speed and continue to beat to stiff peaks until mixture is smooth and glossy. By this time, the mixture should have cooled down. With the mixer running on low speed, add butter one tablespoon at a time. Once all the butter has been added, add vanilla and cocoa powder. Continue to mix until frosting is smooth. Lastly, fold in cooled melted chocolate and mix until thoroughly combined. Transfer buttercream to a piping bag fitted with a large star tip. Frost cooled cupcakes and top with sea salt flakes. Maryanne, I have been craving a good slice of prime rib and literally started drooling reading the intro ;) These cupcakes are adorable! Love the salty garnish! Haha. Totally like not smiling after seeing a puppy! Or eating ice cream and crying. And these cupcakes look magical! These would last mere seconds in our house. I am totally saving these for our next chocolate craving. Maybe even baking some up to pop in the freezer and save for a choco-emergency! Been having a serious chocolate craving today, and these are not helping! They look so good, and I love that they are mini! I love cupcakes! These look great! I want to have my mini cupcakes and eat them all! Chocolate is the perfect dessert this time of the year and I need to get my hands on that Zing..it is right up my alley! I want to have these right now!! I love their size and they look so good!! Thanks for sharing! Love the sea salt on top of these chocolate beauties! These look wonderful and if the cupcake couldn’t get any cuter, you made it mini.